I am long overdue for another DIY project on here. 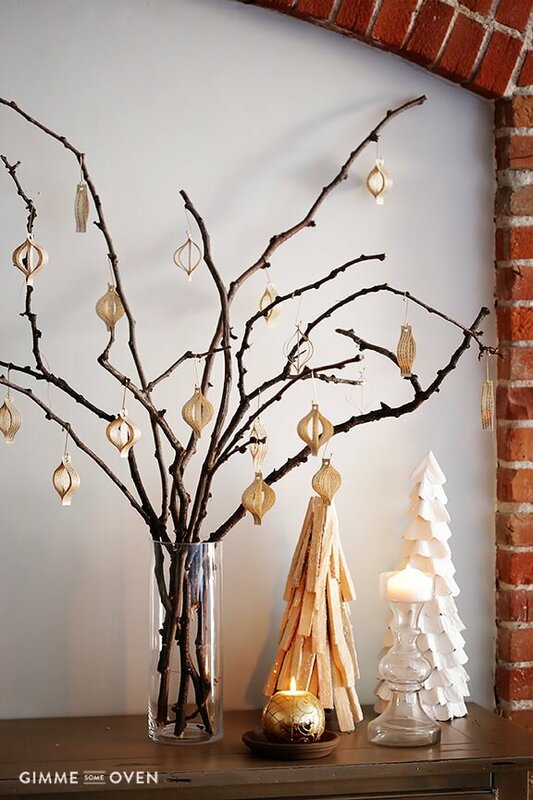 But I’ve been getting crafty for the holidays — as I tend to do — so stay tuned because more projects are on their way! 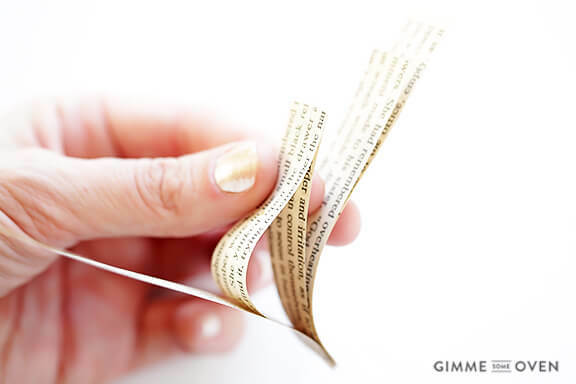 Today, though, I thought I would share this easy DIY book page ornament tutorial with you that I actually made and gave away to my book club members last year. 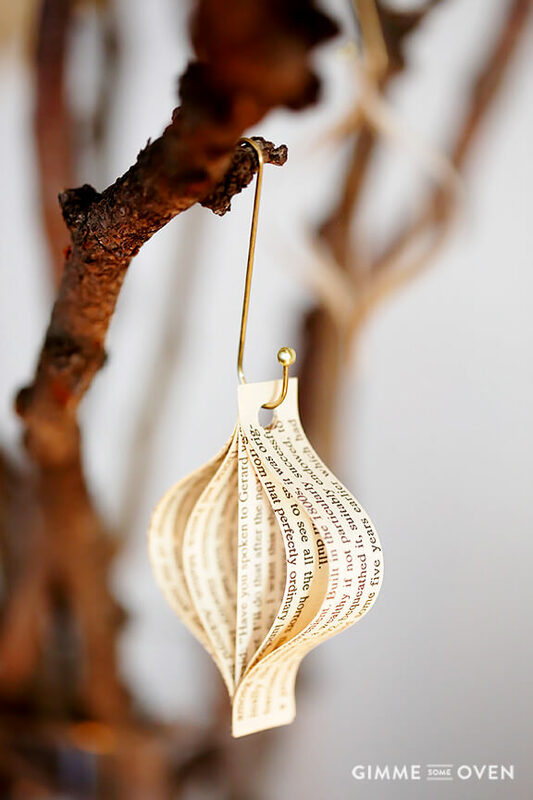 I have a little annual tradition of making Christmas ornaments for everyone from yellowed book pages. (Which is nearly a crime in my book club to tear apart a book, but somehow everyone always survives the literary sacrifice.) This project was by far the easiest one I’ve ever made. Each ornament took a grand total of about 2 minutes once I got rolling, and they turned out super cute! 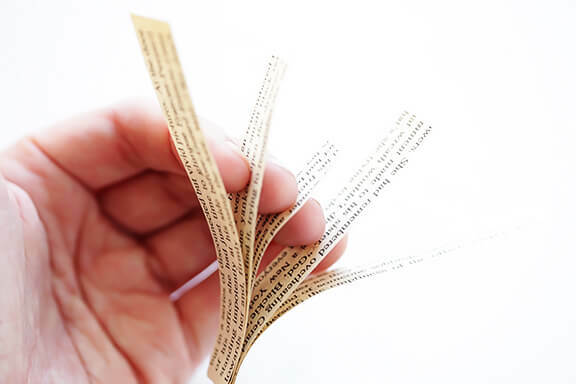 If you don’t want to tear up an old book, you could easily substitute in scrapbook paper, newspaper, or even brown grocery bags for a project like this. 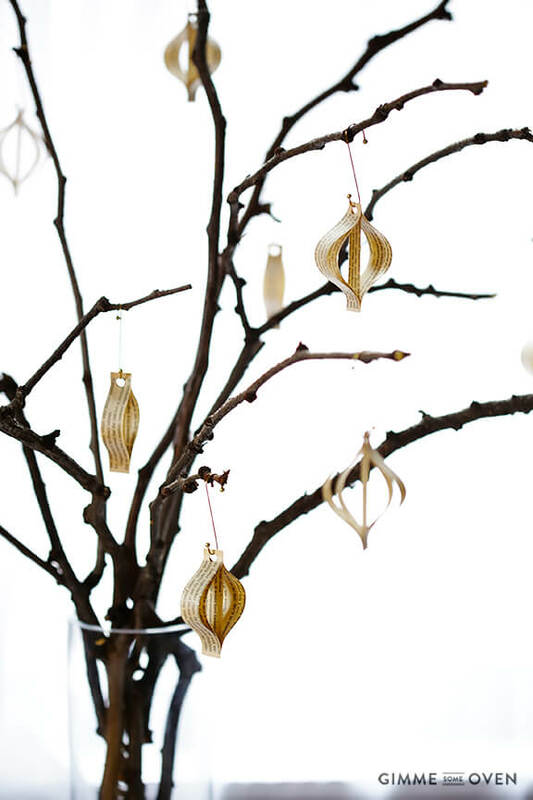 I just recommend using some sort of paper that is double-sided, since both sides will show as these ornaments sway in the breeze. And here was my little display with them last year on my dining room buffet. 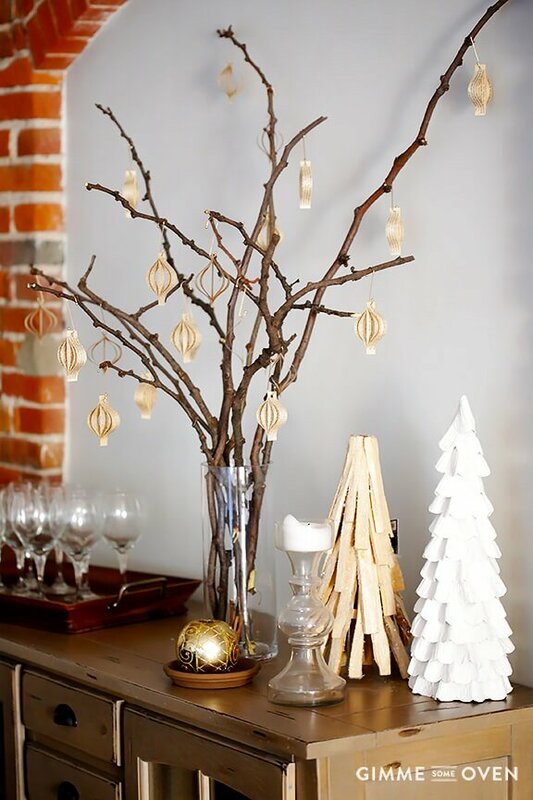 I was actually hosting book club the night that I gave these away, so I just scavenged some fallen branches from the yard and popped them in a glass vase and then hung the ornaments on those. Then everyone took one home as a little gift. It was cute! Then begin glueing the pieces together at the very top (use just a thin line of glue), with the edges even at the top. You want them in this order: long, medium, short, medium long. 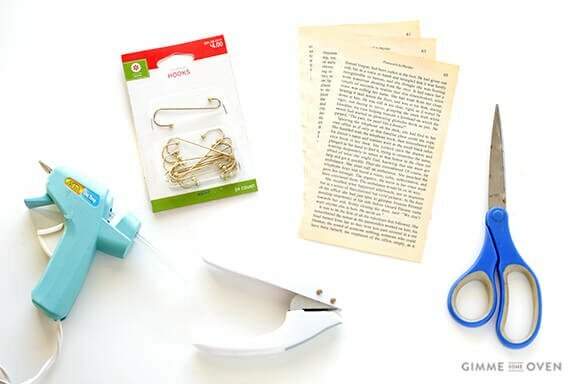 If you are using hot glue, try to apply it as thin as possible, since your hole punch may need to cut through those 4 layers of glue. Afterwards, your ornament should look like this. Next, go ahead and glue the other ends of the ornament together, again being sure that all of the edges line up evenly. 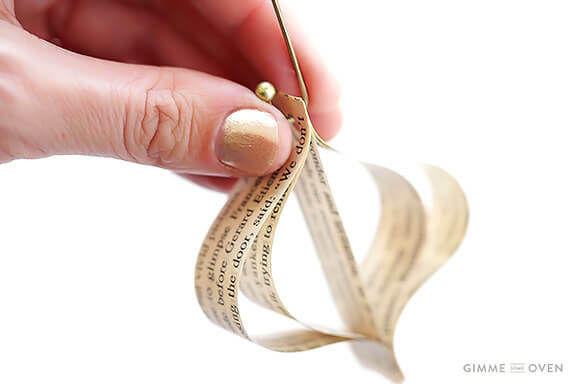 Your pieces of paper will all bow out now and form the ornament. 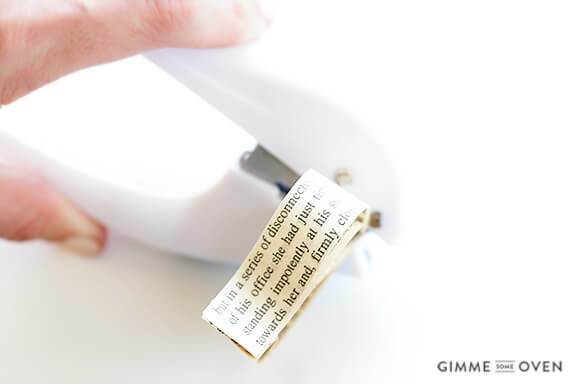 Finally, use your hole punch to make a hole in one of the ends to hang the ornament. And then — voila! — your ornament is ready to go! Enjoy! And hey — if you make some of your own — be sure and snap a photo and hashtag #gimmesomeoven so that I can see your creations! These are absolutely amazing and beautiful! I love this idea! 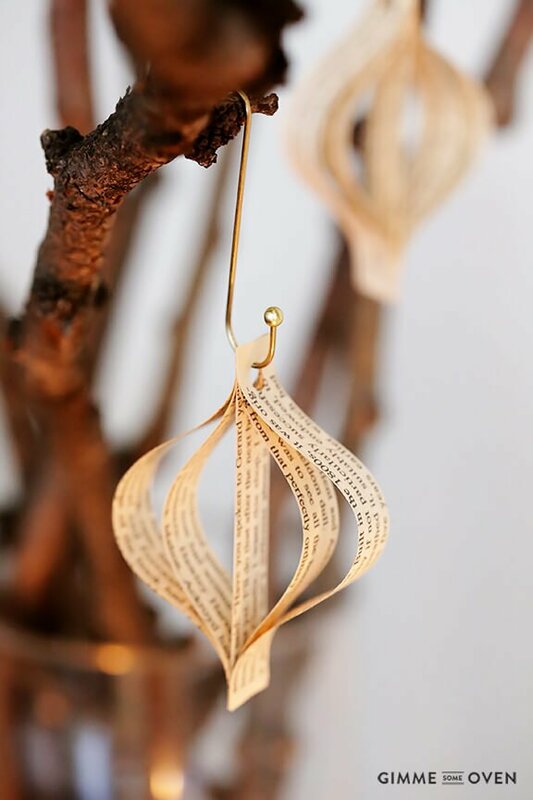 I made a book page wreath for our dining room and was looking for an idea for my small tree in that room! These look great! Can’t wait to try! 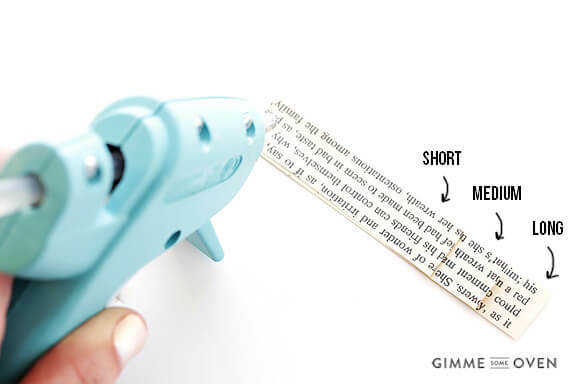 These are such an awesome idea! I must try! Thanks for the inspiration! In addition to making these for myself, these will make great stocking stuffers! Okay, these are insanely adorable. Pinning and making asap! These are adorable, I am going to have to make a thrift store run for a book. 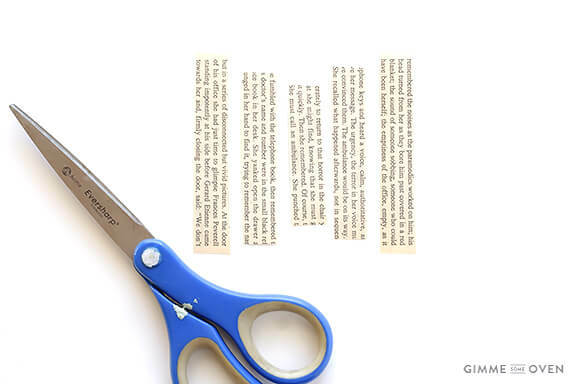 Though cutting up a book might be really hard for me too. Girl, this is genius. Simply vintage. I’m hunting for newspaper right now. This reminds me of the types of ornaments we made as children at Christmas, but we only had paste glue. Hot glue can hold things together a lot better than paste, but you have to watch out so that you don’t glue a burn onto yourself! Really cute ornaments, thanks. What I like the most about paper ornaments is variety. 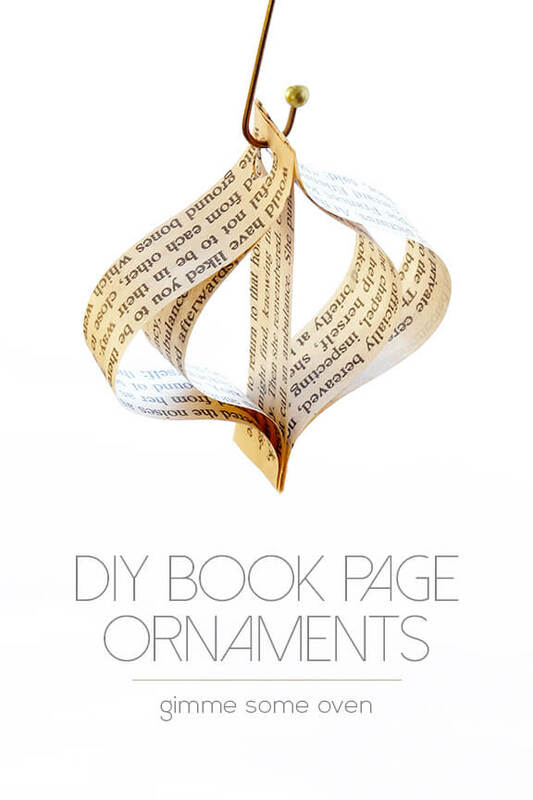 This DIY easy book page ornament is a good fit for those who are looking for affordable gifts that are still meaningful and kind of fun. 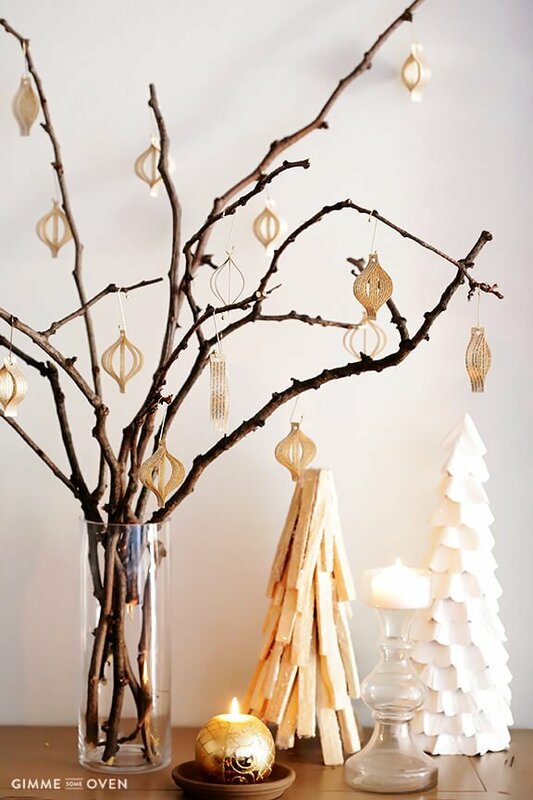 And for those who lack the talent or time or money, such DIY ornaments are absolutely helpful. You’re very welcome Susan, we glad you enjoyed it! I think these would be adorable with double sided scrapbook paper, too. Or maybe even some metallics in there for bling! Old floral catalogs would be great for non traditional tree colors. Will try some for our church bazaar! Than.